Among the many different effects the Downtown Ottawa Transit Tunnel (DOTT) and its construction might have, as published recently in the environmental assessment (which is available for perusal here), is the potential impact it could have on certain wildlife species-at-risk along the proposed route. 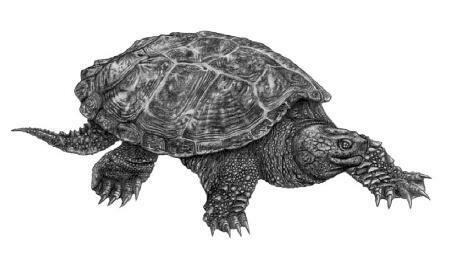 One of those species-at-risk is the common snapping turtle (Chelydra serpentina). The common snapping turtle is an aquatic species that inhabits the Rideau River. The species searches for nest sites in sandy areas in June and may wander into the construction zone. Silt fencing placed near the river as part of the sediment and erosion control program should prevent access to the construction zone by this species. If a snapping turtle is found during construction, the Ministry of Natural Resources, Kemptville District should be contacted. Similar to the milksnake, the snapping turtle isn't on the IUCN red list--meaning that the population at large is likely not endangered. However, the species is one of special concern to the Committee on the Status of Endangered Wildlife in Canada (COSEWIC) as of November 2008. The reason for this classification is because the population is particularly susceptible to urban encroachment, which can quickly cause a severe drop in population. COSEWIC also cited the general downward slope of the population, and in their 2009 assessment and status report (.PDF available here), noted that snappers have unusually high rates of nest and egg predation due to the density of 'subsidized predators' like raccoons, skunks, opossums, and coyotes (and a lack of larger predators [like wolves and cougars] to keep those mid-level predator populations in check) in urban areas. Two other species were also brought up in the EA: The peregrine falcon and the eastern milksnake.